The first round saw the surprise defeat of the 2012 UK-Racketball series champion, Tom Phipps, as he went down to Roger Alger, 11-6, 14-12, 4-11, 11-6. Phipps had been struggling with an ankle injury, and was unable to use his usual explosive movement and speed to gain any advantage, with Alger extending the rallies and playing controlled racketball in the end Phipps just ran out of options. In the last 16 there were some fantastic games as Johnny Harford defeated Elliot Selby, and Mark Fuller just made it through against Chris Truswell. Mike Edwards ran hard and almost took down Neil Chambers, who is ranked number 12 in the country. Dom Hamilton made it through against local boy Jake Grayston in four closely contested games. Tim Vail was up againstTed Jeal, who was the 2009 finalist. It was a tough game as Tim took the first 11-8, only for Tedto fight back and take the second 8-11. In the endTim made Ted do an incredible amount of work, and a couple of extra errors from Ted and a couple of extra winners from Timwas all that decided it. Tim took the match 3-1. Anthony Graham against Jonny Harford was an absolute slog. Harfordinitially went 1-0 up, but Anthony Graham won a brutal tiebreak in the second that sapped the energy from Johnny. Despite Harford going 2-1 up in the third, it looked like Graham had finally worn down Harford, and Graham took the final games 11-5, 11-5. Mark Fuller had a similar slog, beating Andy Corben 3-2 in just over 70 minutes. Dom Hamilton came in 3-0 against Neil Chambers, but 3-0 was a flattering score line with all games going right down to the wire. On the last day in the Semi Finals, Tim Vail comfortably beat Anthony Graham 11-6, 11-5, 11-6. Vail just had too many winners and his racketball speciality shone through, as Vail found angles that Graham just didn’t know existed. Mark Fuller defeated the 2010 UK-Racketball Series Champion and Racketball Hero, Dom Hamilton, 3-1 in another close match. In the end,Fuller’s fitness was all that really separated the competitors. Fuller pulled away in the last two winning 11-7, 11-5. Tim Vail capitalised on his early form in the tournament, hitting a tremendous number of winners. Vail played up to the crowd with two very quick games, which he took 11-3, 11-6. Fuller fought back in the third and managed to tighten up, trying to run his way back into the match. Ultimately it was Vail’s superior racketball class that shone through. He managed to find enough winners to see out the game 13-11 and take home his fifth National Racketball title.Vail only dropped one game throughout the event and is definitely top of the racketball game! Sam Mueller ran hard against both professional squash girls, taking a game off Sarah-Jane Perry. She displayed her usual tenacity that’s be on show throughout the UK-Racketball Series so far, but in the end it was all down to the final between Sarah-Jane Perry and Lauren Selby. Over the last few years, Lauren has always come second to Laura Hill, but without Laura in the draw, she must have sensed that this was her time to finally take the crown. It was a great final with Sarah-Jane. She has become a fantastic squash player over the last couple of years, taking WISPA titles in both America and Europe. But this was her first time on the racketball centre stage. Lauren started the final, the better of the two, probably owing to the racketball experience behind her. However, Sara-Jane’s shots and fitness started to show in time to take the third game and draw the match back to 2-1 to Lauren. In the fourth game it was tight all the way with two lucky bounces right at the end deciding the game 13-11 in Lauren’s favour and the match 3-1, giving Lauren her first National Title. The un-seeded Nicholas Staunton from Lemington Spa, had an amazing run in the top half of the draw. First he had a tough 3-1 against Michael Ypes, the 5/8 seed, before going on to defeat the ¾ seed, Paul Johnson in five games, including two tiebreakers with both of them going Staunton’s way. He then managed to back this up on the semi-finals day with a victory against England Squash’s Matt Baker. It ended 3-1 in another tight game, where again Staunton managed to claim the big points in the tiebreak. In the other half, last year’s finalist, Rich Davies, came through comfortably in the first two rounds barely dropping a point, before having a tough battle against Devon’s Christian Turner in the semi finals. It was a marathon match but Davies came through, 3-1, looking like the stronger of the two. In the final, Staunton’s legs started to look a little bit shaky after the brutal matches running up to the final. Davies looked solid throughout and won 11-4, 11-4, 11-4, to take his first title. In the Women’s Over 35’s, Karen Bealy played well and fought hard againstGail Stuthridge to take a game. The over 35’s Champion was Sarah Taylorwho looked comfortable throughout, taking both games 3-0, and with that, the title. It was another big draw in the Men’s Over 40’s with 23 entries. James Powley, at 5/8 seed, came through against Ian Ingram in straight sets before taking on the number one seed, Pete Goodings in the quarterfinals. It was a brutal match, as Goodings took the first two games, and looked like he was going to go through Powley 3-0. However, Powley fought back, dug in, and chased down every ball, pushing Goodings to start making mistakes. The third was extremely tight, finishing 11-7, the fourth was comfortable at 11-3. In the fifth and deciding game, it could have gone either way, but eventually, Powley managed to sneak it at 12-10. A fantastic victory and the number one seed out. The next day, Powley managed to back his victory up this time taking downDavid Lord 3-1 in the semi finals, before facing another un-seeded opponent,Andy McDonald in the final. McDonald, who made it all the way from the last 64 in the bottom section of the draw, after defeating ¾ seed, Mark Francis, and UK-Racketball favourite,Mark Steedon was on a roll. However, he couldn’t keep up with Powely who won the final relatively comfortably 8-11, 11-8, 11-3, 11-4 to claim his first National Title! This was one of the largest draws in the women’s category. The number one and two seed ended up coming through the draw. Claire Walker in the top half had, by far, a more comfortable run, defeating Jo Shelley 3-0 and thenSam Mueller 3-0, without dropping many points at all. In the bottom half, Vikki Jarvis had a tough opener against Helen Cann, the first game ending 13-11. Next up, Jarvis had a tough five set battle againstGail Stuthridge in the semi final, coming through 12-10 in the fifth. In the final, Jarvis started well, taking the first game off Claire Walker. However, Walker’s strengths came through in the third taking it 13-11 on tiebreak and the match 3-1, crowning Claire Walker Women’s Over 40’s National Champion. It was another big draw for the Men’s Over 45 category with half the matches having to take place in the last 32. The big upset in the draw was when the two seed, Buzby Williams, lost toJason Fearn in the first round. Jason had made it all the way from the last 64 to overcome Buzby in a heated contest, with plenty of discussion. In the end, Buzby seemed to struggle to keep focus in the final two, with Jasontaking them 11-3, 11-3. Jason then went on to battle hard against Marc Thornley, but didn’t appear to have enough in his legs to close Thornley out. In the top half, number one seed Neil Baldwin came through comfortably all the way to the final, before he was pushed incredibly hard by Marc Thornleyin what was a very tough four games for both of them. Baldwin took the final two games with only two points in it, 13-11, 11-9. The number one and two seed met in the final, as Lesley Sturgesscame though against Julie Lawtonin one of the closest finals of the day finishing 8-11, 11-9, 11-9, 11-9. All games were incredibly close throughout, but Sturgess managed to always take the key big points and push through right at the end when it mattered. In another big draw, series favourite, Gabriel Uttley, came through againstNick Tobin, before losing to Paul Smith in the quarterfinals. Number two seed Keith Palmer came through very comfortably in both his first and second round, in the bottom half of the draw. He annihilated Kerry Mason 11-3, 11-3, 11-3, before doing the same to Michael English, 11-2, 11-3, 11-5. However, Palmer came unstuck against series boy Patrick Osborn, who defeated him 11-7, 11-3, 11-5. 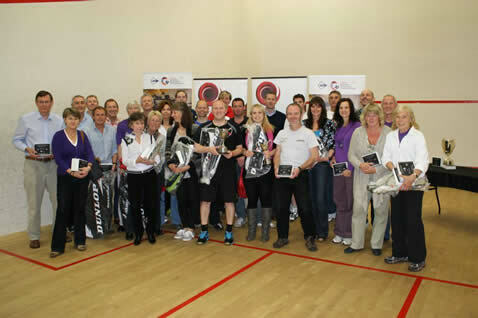 Osborn went on to face Racketball Legend and National Title Collector, Stephen Wall in the final. It was an epic encounter between Wall and Osborn, with Osborn taking the first 14-12, and the second 12-10 before Stephen Wall’s fitness and experience started to shine through, taking the next three 11-4, 11-5, 11-4. Then it was back to business as usual for Wall, but a fantastic final for all. The Over 50’s went to seeding, with one and two seed, Lesley Sturgess andChristine Park respectively, meeting in the final. Park beat off Jo Mosley in the semi finals 3-0, 11-8, 13-11, 11-8. In the top end, Carolyn Linsay metSturgess in the other semi final, which Sturgess won 3-0. Sturgess went on to win the final 3-0, having not dropped a game in the tournament. Series favourite, James Murphy, made it through against Ricky Smart, finishing 3-2 in the last 16 before losing to local hero, Rob Shay in a very tight 3-1 in the quarterfinals. Patrick Martin fought ¾ seed, Richard Waller hard, but it was Waller that made it through to the quarterfinals. Waller then lost his match to Lyn Stockham 3-0. David Manning almost went the same way as the other ¾ seeds, but just about managed to hold on against Jeremy Horrocks, taking it 11-8 in the fifth to make it to the semi finals. Number two seed, Nigel Millington came through comfortably, finishing 11-7, 11-7, 11-7 against Clive Hickford. In the semis Rob Shay beat Lyn Stockham in the top half, with David Mannings taking down the number two seed, Nigel Millington in the other semi final. David Manning then went on to back this win up with a tremendous effort in the final, to claim a National Title in five sets against Rob Shay. The final wasManning’s third 3-2 of the tournament, having also played a 3-1 previously. It was a considerable effort by David Manning to keep backing that up throughout the tournament, and it was worth it, finishing with a National Title. Linda Smith came through her first round after a really tough encounter with Claire Hambleton ended 3-2. Smith went on to face number one seed, Bett Dryhurst in the final. It was a great first game withBett taking it deep in the tiebreak 14-12, before then pulling away 11-5, 11-3 to take the title. Both seeds struggled in the bottom half of the draw. Alvin Ranson took out the two seed, William Mulholland. Peter Pietruszka came through against ¾ seed, Colin Thompson. In the bottom half, the semi final was a battle between the seed choppers, with Pietruszka coming through 3-0 to claim a place in the final against number one seed Ian Graham. In the end, Graham was too strong, despite Pietruszkaputting up a tremendous battle in the second, but losing the tiebreak.Graham claimed the third game 11-0, and the National Title. It was a close battle for second place with Ali Wood just piping Gill Wagnerto the post. Bett Dryhurst won all of her games 3-0 to take the title. The number one and two seed came through the draw to meet in the final. However, it was a tough battle in the semi final for number one seed, Robert Astbury as he came up against Peter Curwen from Chapel Allerton.Astbury took the first in the tiebreak and then the second comfortably, beforeCurwen fought back to take the third 11-9, the fourth 11-6. It went right down to the wire in the fifth, but Astbury snuck in the fifth game by three points. In the bottom half John Houghton, the number ¾ seed was defeated by un-seeded Jan Cowper. Cowper came through against Jack Clay in the first round and beat Houghton 11-4, 11-5, 8-11, 11-4 in the quarterfinals. In the semi finals Cowper didn’t have enough against the number two seed,John Cockhill. In another tight encounter, Cowper took the first game 11-7 before Cockhill came back to take it 11-6, 11-9. The fourth went to a tiebreak, which ended 12-10. In the final, number two seed John Cockhill, overcame the one seed, Robert Astbury comfortably. Cockhill won the match 11-5, 11-5, 11-9, withAstbury suffering slightly from the fiver setter he had faced in the semi final only a short while before. It was a four player round robin in the over 65’s, and every player had three games. Audrey Coulson was unlucky against Gloria Saunders in the battle for the title. Both had defeated Ali Wood and Gill Wagner 3-0 before a fight between themselves for the crown. In the end it was 3-2 to Saunders in a fantastic final. All seeds made it through to the quarterfinals stage in the Over 70’s. The number one seed, Bev Pegg, made it through to the final in the top half. But in the bottom half, the number two seed lost out to ¾ seed George Aplin in the semi finals, 11-9, 11-7, 119. It was another five setter final, with Bev Pegg coming through. Pegg lost the first game in a tiebreak before coming back in the second and taking the third in a tiebreak. Aplin came back again in the fourth 11-8, but finally, Bev Pegg managed to pull away and dealt a fatal blow to Aplin, to take the fifth game 11-4.